My foster mum says I am a very sweet boy who will need time to settle in. He is a little shy but with time will be bouncing around like any other kitten. He loves other cats. 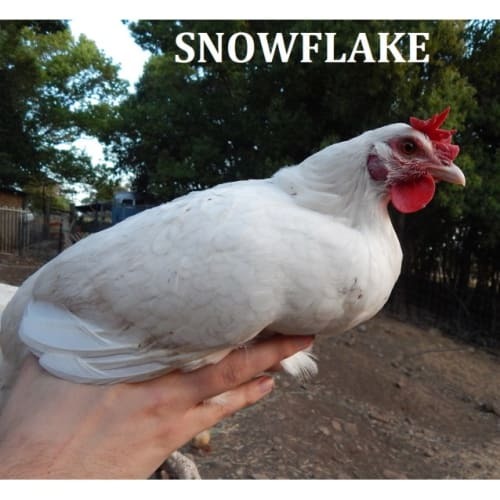 He does enjoy playing, getting a scratch and little cuddle, but is not overly social yet. My foster mum believes that once he is attached to his new parents he will be much more sociable. :)Amico was pretty shy at first and it took him a couple of days to settle in. Once he gets to know you he loves head rubs and purrs like a trooper!He is a lovely natured boy. He loves to play and is very curious. He like to be near people He can be wary of children but is very tolerant and he will let you know when he has had enough affection and attention.Come and meet me in willagee. Sybil is a very sweet tiny lady... she might be a 2 year old but looks like she is only 7 months old and has the softest coat. So if you are looking for a non-needy forever kitten she is the purrrfect little pocket pal. We think that being lost and being separated from her boy has made her sad and nervous. Being shy, Sybil needs plenty time and patience to trust you're not going to trick her and she will eventually come out of her shell. 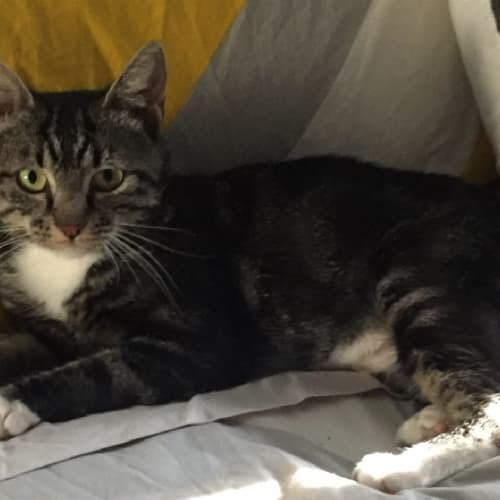 She is very quiet, absolutely non agressive, uses her litter with precision and with coaxing she loves pats and will spend forever soaking up the attention with her tiny little motor purring with delight and even provide the odd bonus dribble of happiness! 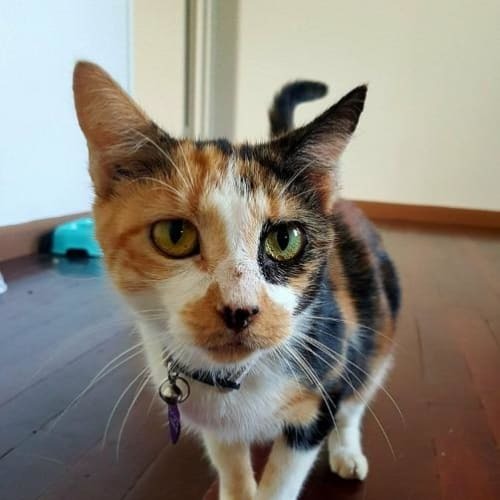 Sybil will need a dog free home and however I think with the right introduction she would be ok with a feline friend, in fact I think it may help her to bond with another more people confident cat. She spends a lot of time hiding in her safe spots but is slowly learning that the bed is a very luxurious lounge to steal pats and head scritches! Rory was rescued from the Mt Isa pound so his history is unknown. He is a bundle of energy and just loves to play and run around. 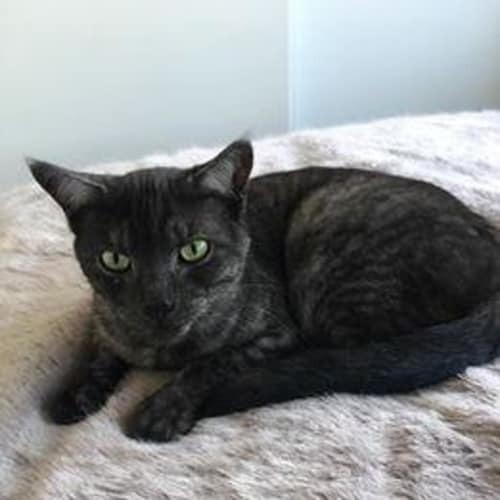 He is a little timid at first about being touched so will need an understanding and gentle home to go to for him to gain confidence with humans. But he does love a good tummy wrestle and a nice pat once he has gained trust in you. His favourite thing to do though is play. 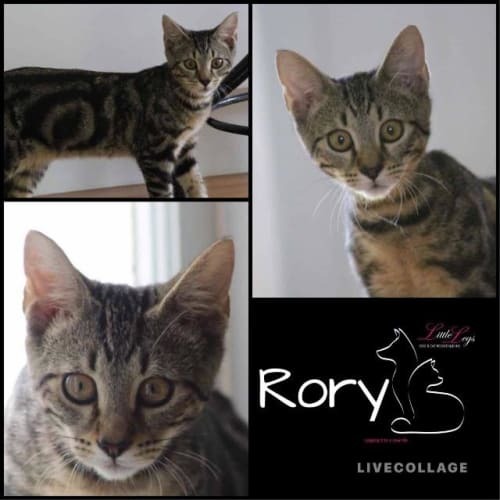 If you are after a very playful kitten and you have a home with older children who can be patient with him in the beginning then you will find Rory to be a fabulous and yet crazy addition to your home. 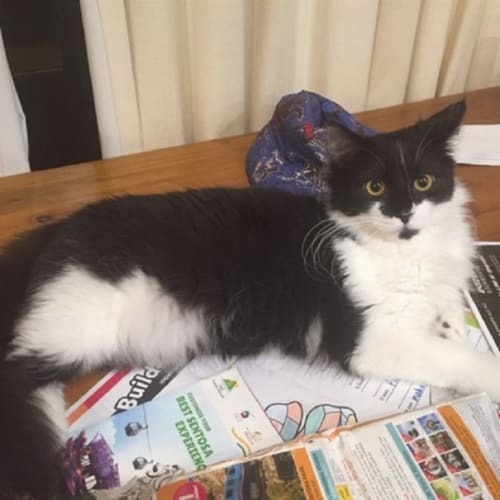 Rory is more of a play kitten than a cuddle kitten so you will need to consider this when choosing the right kitten for you.All Dogs, Cats, Puppies & Kittens go to their new homes: DesexedVaccinatedMicrochippedUp to date Flea & worm prevention. To apply please follow the appropriate link:Dogswww.llsqld.com.au/dogapplicationform.htmlCatswww.llsqld.com.au/catapplicationform.htmlPocket Petswww.llsqld.com.au/pocket-pet-adoption-form.htmlAll our animals go to their new homes with an in home trial period.Pocket Pets : 7 days Adult Cats : 14 days.Dogs & Kittens : 7 days. 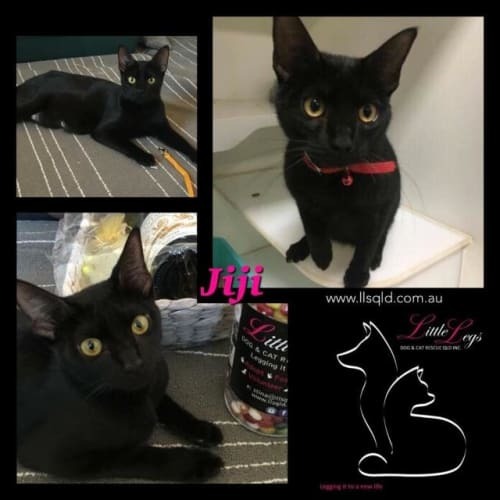 Jiji was dumped at a pet hotel at 7 months old with a belly full of kittens. Since then Jiji has been a great Mum and raised four kittens who are all finding their forever homes too. Jiji is a real character. She is a super smooch at times. She also is very active and playful. I love watching her do zoomies down the hall. She gets along well with other cats. She plays best with my Male cat as they both can be rough with play at times and neither seems to get upset about it. Jiji also shares the house with a German Shepherd. She was at first unsure about this large beast but has since become use to him and he doesn't really phase her now. Jiji can be quite a smooch. Loves to rub her face on yours. She loves attention and kisses. She's happy to be picked up. Jiji has had a rough start and deserves the best forever home. She just has so much love to give despite her past.All Dogs, Cats, Puppies & Kittens go to their new homes: DesexedVaccinatedMicrochippedUp to date Flea & worm prevention. To apply please follow the appropriate link:Dogswww.llsqld.com.au/dogapplicationform.htmlCatswww.llsqld.com.au/catapplicationform.htmlPocket Petswww.llsqld.com.au/pocket-pet-adoption-form.htmlAll our animals go to their new homes with an in home trial period.Pocket Pets : 7 days Adult Cats : 14 days.Dogs & Kittens : 7 days. 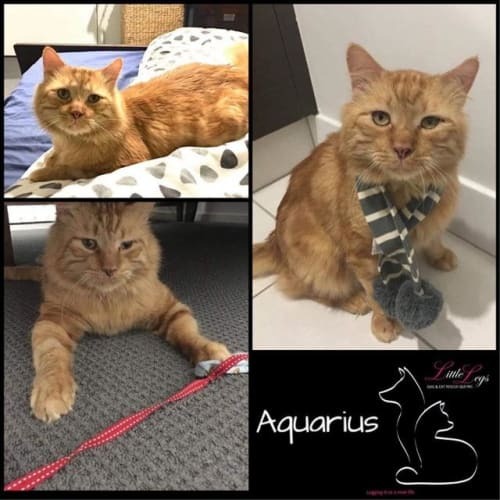 Name: ZeusBreed: DSHDOB: November 2017Sex: Male Medical Notes: Juvenile Gingivitis (currently being treated) Behaviour Notes: NoDog Friendly : Yes Cat Friendly: Yes Child Friendly: Untested Litter Trained: YesLocation: Mt Gravatt (until end Jan '19) Adoption Fee: $130ABOUT ZEUSZeus is a handsome boy who loves cuddling up on the sofa of an evening getting some attention and showing off his little purr. He has beautiful soft fur that he keeps clean and tidy. He has been around other cats all his life so gets on well with them and enjoys a play with his foster brother. 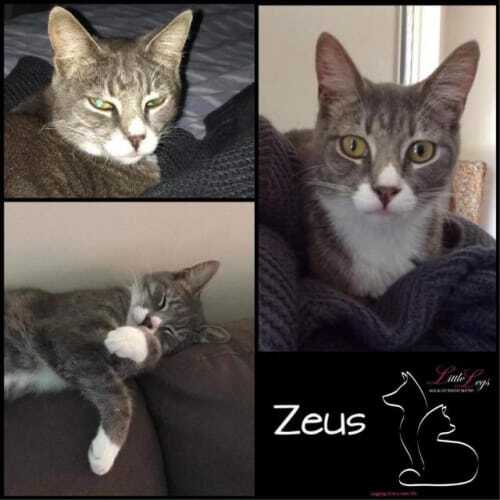 He has been around some dogs and is not bothered by them.Zeus has been in care for his life so far and has come on so well in a home environment would therefore love to find his forever home now while he is still young. Zeus can get scared so takes a little while to trust people but when he gives you his trust he is a little snuggle bunny who loves sitting next to you getting pats and attention. He tends to take himself off during the day but of an evening will sit with his foster mum and is never far away at night. Zeus has had juvenile gingivitis and as a result has recently had his front teeth removed. He has recovered very well and seems much happier as a result. 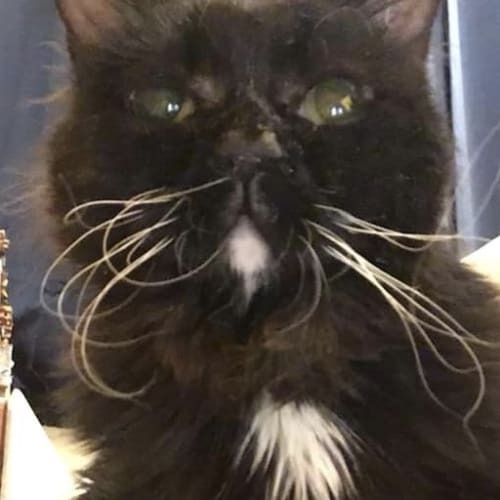 He is eating well and whilst his other teeth will need monitoring and maintaining with dental food to keep them clean, the early signs are good and he does not seem troubled by the loss of some teeth. 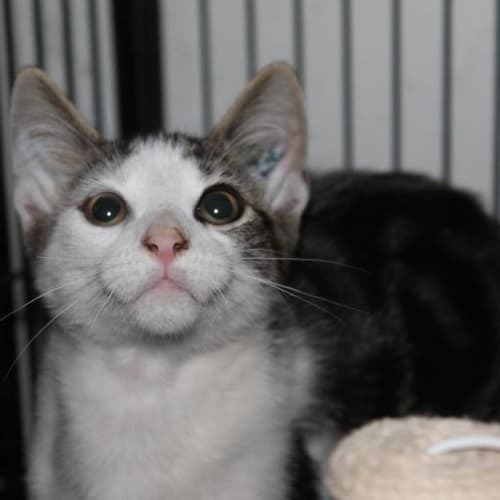 This beautiful boy is a little cutie and now ready to find his forever home. &#128171;To be considered for a meeting please fill out our obligation-free application form below. Applications will be forwarded to the carers. *Please Note- Some animals are extremely popular and generate a lot of interest, carers will call only suitable applicants to arrange meetings and not every applicant will receive a call back.http://www.llsqld.com.au/catapplicationform.html * All Little Legs cats are desexed, microchipped, vaccinated prior to adoption **All Little Legs Cats are given a two week ( 14 days ) trial period and can be returned for a partial refund during this time*** Enquires ~ Stina Cat Coordinator cats@llsqld.com.auAll Dogs, Cats, Puppies & Kittens go to their new homes: DesexedVaccinatedMicrochippedUp to date Flea & worm prevention. To apply please follow the appropriate link:Dogswww.llsqld.com.au/dogapplicationform.htmlCatswww.llsqld.com.au/catapplicationform.htmlPocket Petswww.llsqld.com.au/pocket-pet-adoption-form.htmlAll our animals go to their new homes with an in home trial period.Pocket Pets : 7 days Adult Cats : 14 days.Dogs & Kittens : 7 days. 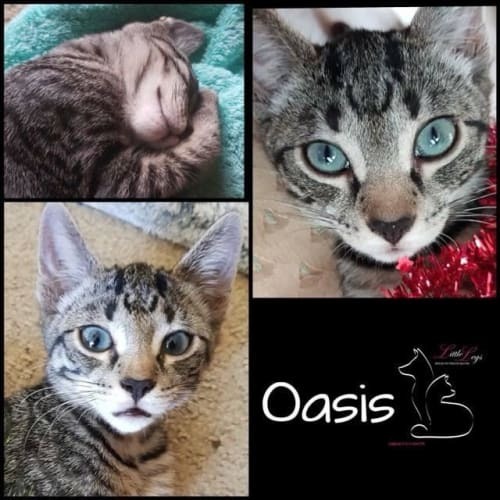 Oasis has a loving personality. She loves to snuggle and will lick your hand or arm. She also loves her food and seems to know when you are in the kitchen and will talk to you about how much she would like to have that food. She is good with the other cats and dogs here.Oasis has previously presented Cat Flu although is currently symptom free. Desexed &#10004;&#65039;Vaccinated &#10004;&#65039;Microchipped &#10004;&#65039;Regular flea & worming &#10004;&#65039;&#128077; All kittens go to their new homes with a 1wk trial period.All Dogs, Cats, Puppies & Kittens go to their new homes: DesexedVaccinatedMicrochippedUp to date Flea & worm prevention. To apply please follow the appropriate link:Dogswww.llsqld.com.au/dogapplicationform.htmlCatswww.llsqld.com.au/catapplicationform.htmlPocket Petswww.llsqld.com.au/pocket-pet-adoption-form.htmlAll our animals go to their new homes with an in home trial period.Pocket Pets : 7 days Adult Cats : 14 days.Dogs & Kittens : 7 days.